Recorded in 1975 at Producers Recording Stuido in New York. 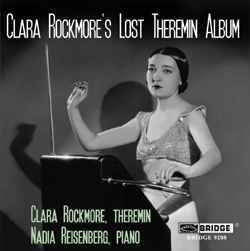 Packaged with a 16 page booklet that contains an interview with Clara Rockmore and Robert Moog. Track 8, the Adagio is mislabeled on the release. It's listed as BWV 968 when in actuality it's the first movement of Harpsichord Concerto No.5 in F minor, BWV 1056.